A talk by Shervin Farridnejad (Berlin/Vienna). Monday, 23 January 2016, 06:30 PM, Österreichische Orient-Gesellschaft Hammer-Purgstall Dominikanerbastei 6/6, 1010 Wien. This talk is the third and last of a talk series “Kulturwissenschaftliche Iranforschung“, organized as joint events by the Institute of Iranian studies (IFI) at the Austrian Academy of Sciences (ÖAW) and the Österreichischen Orient-Gesellschaft Hammer-Purgstall, Vienna. The talk will be in German. Rituals play a prominent role in Zoroastrianism, one of the oldest continuous religions of humanity. The importance and practice of the Zoroastrian rituals extend over a wide range of social and local environments, from houses to fire temples as well as from antiquity to modernity. While the sources for exploring Zoroastrian rituals in pre-modern times are predominantly confined to traditional and priestly texts, we have a broader set of sources for modern and contemporary times, including the living ritual tradition of priests and laities. 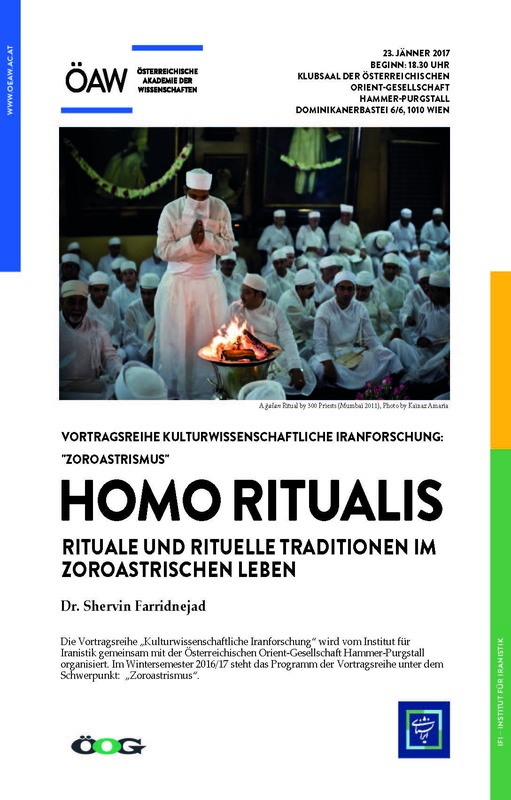 The lecture deals with the presence and importance of the rituals as well as the ritualistic traditions in Zoroastrianism. You can download the whole program of this talk series here. Shervin Farridnejad is a Postdoctoral Research Fellow and Lecturer at the Institute of Iranian Studies (IFI) at the Academy of Science (ÖAW) in Vienna and at the Institute of Iranian Studies at the Freie Universität Berlin.